Who takes the rubbish down? At this altitude, even the impact of a one-centimetre large particle releases as much energy as does the explosion of a hand grenade. No wonder, for the objects orbit Earth with a speed of 28,000 kilometres per hour, making them fifteen times faster than a projectile shot from a rifle. "The situation is serious", says Adolf Giesen, Director of the Institute of Technical Physics at the German Aerospace Center (DLR) in Stuttgart. "Every month, satellites have to fly evasive manoeuvres to avoid such collisions. Also the astronauts in the ISS space station have to repeatedly transfer to the Soyuz spacecraft, because a piece of debris approaches and there is not enough time left for avoiding it." The spacecraft is better protected and smaller, which reduces the likelihood of being hit. Currently, some 25,000 objects are being monitored from Earth. These are remains of rocket propulsion stages, disused satellites and their fragments. "In total, however, some 700,000 objects buzz around the Earth, and which are not known in detail simply because they are too small or fly on trajectories that are not as well observed", says Giesen. 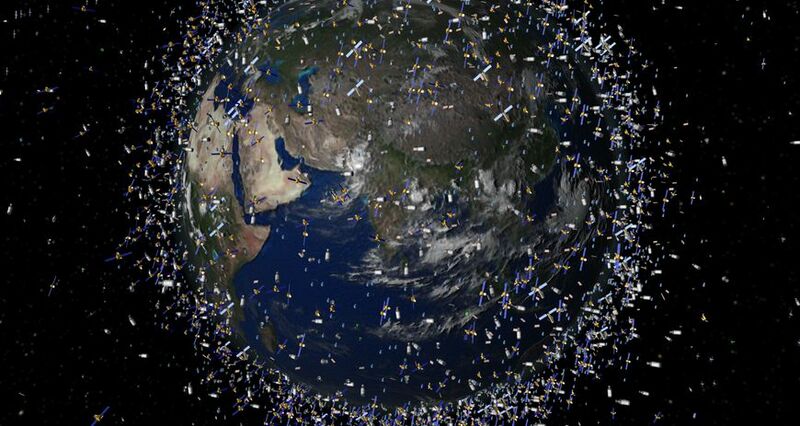 And each individual object has the power to damage or destroy satellites. Not to mention the really big ones. Take the European environmental satellite Envisat: easily nine metric tons heavy, 26 metres long and with a diameter of three times three metres. It was designed to last until 2007, but survived for six more years. Six years in which one could have made it come down in a controlled way - until contact broke off. For nearly two years now, it has been speeding through the orbit fully out of control. Giesen: "If it was to be hit by a larger object, it will be demolished into hundreds of thousands of new objects. Within a few months to years, these would clear away all functioning satellites in the entire area of its trajectory." In 800 kilometres altitude, of all things. As it were, this is where the satellite motorway runs, where the most satellites travel. This altitude still provides some atmosphere and a little air friction. Here, objects can keep up to 50 years before they are slowed down to such a degree that they burn up in the Earth's atmosphere. Below 800 kilometres altitude, air friction slows down objects to such an extent that they fall down to Earth within only a few years. It was at this altitude that the so far most spectacular crash happened in 2009, when the US satellite Iridium-33 and its Russian mate Kosmos-2251 collided. "At that time, a mass of 1.5 metric tons was involved and already resulted in an abrupt and considerable increase by about 20 per cent of particle density at this altitude", says Wolfgang Riede, head of department at the DLR. Just this crash, together with the targeted downing of a Chinese weather satellite in early 2007, an act by which the Chinese had intended to demonstrate their technical and military capabilities, increased the number of scrap objects larger than ten centimetres by more than half the previous number. And each collision creates new fragments, which in turn increases the danger of new collisions. 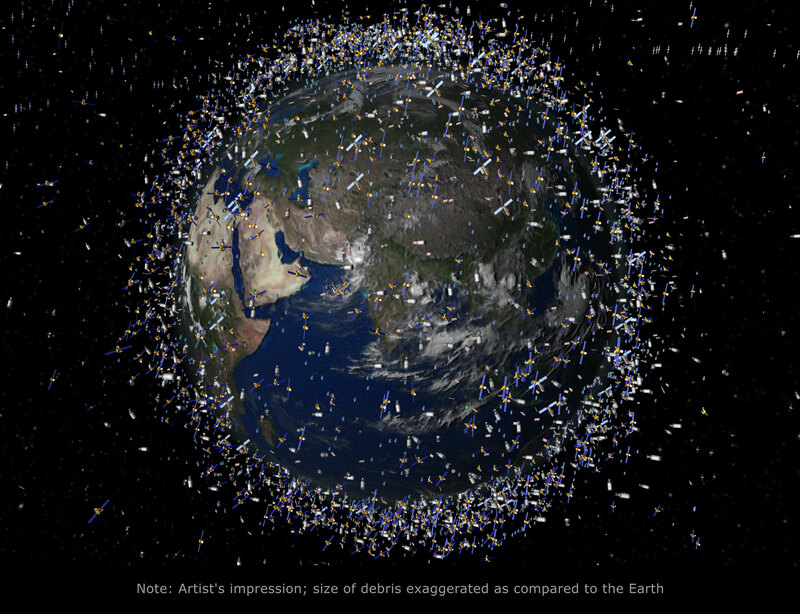 The marked increase of space debris could endanger also navigation, research, communication and television satellites. The consequences for the economy and society would be enormous. Unfavourable scenarios even question in how far space travel will be possible at all in a few decades. Yet what can one do against this space debris? One possibility would be to build satellites in such a way as to make them survive smaller collisions. Satellites usually have a protective layer that can protect them from objects of up to half a centimetre in length. The protective layer of the ISS even wards off objects of a size of up to one and a half centimetres. Theoretically, it would be possible to strengthen the protective layer. Yet that would reduce the useful load that could be carried. Wolfgang Riede: "The Ariane rocket can carry a total of about zwenty metric tons to a low orbit; if I increase the protective layer by one metric ton, I can carry one metric ton less cargo." As a basic principle, one calculates 30,000 Euro for each kilogram that is launched into space. So cleaning up is urgently required - the question being how. Perhaps by launching a satellite that catches other old satellites with a robotic arm, slows them down and causes them to crash? "A very tedious business", Adolf Giesen points out. "If the satellite itself was to crash in the process, 200 or 300 million Euro would be gone in an instant." One could construct it in such a way to make it capable of inducing controlled crashing of several satellites in fast succession. "But up there one cannot simply steer and drive around in curves. If the satellite wants to change its trajectory, it can only do so by propulsion at those points where the two trajectories intersect." And that happens rarely: "If one was to get down the five largest satellites in declining order of size, the whole affair would take 25 years. If I were to say, I take those five of the 25 largest satellites that can be reached fastest, this time frame reduces by half, but this still takes more than twelve years." The idea of weaving a kind of net made of electrically conducting wires for capturing space debris likewise remains sketchy. "You won't get the small objects with this method", says Giesen. Alternative ideas discuss the option of capturing larger debris mechanically by casting a net - fishing in the orbit. This is why DLR is working on a laser that targets the space debris object by object from down on Earth, thus enabling significantly more precise measuring of its trajectory down to ten metres. This at least makes collisions predictable. And precision is urgently required: Prior to the collision of Iridium-33 and Kosmos-2251, radar measurements predicted that the two objects would move past each other at a distance of 504 metres. This is why minimising the probability of a collision and reduction of the course corrections of satellites and space stations to the absolutely necessary minimum is the first step. The second step: To increase the power of the laser to such an extent as to make it capable of influencing the trajectory of the scrap objects, to deflect them so that they enter into the Earth's atmosphere and burn up. "Laser with the required strength exist already, however, they can fire only twice per day", says Giesen. "Yet we need 10 to 100 shots per second, that is, a laser with a medium performance of one megawatt." Until such time, many parameters must be taken into consideration. DLR envisions a time frame of ten years. In the meantime, it must be feared that the nations involved in space research will continue to pass responsibility from one to another. This is why in the short term it is important to obligate operators of new satellites to crash their satellites in a controlled manner before the scheduled end of their life cycle or to remove them to a so-called cemetery orbit. As can be seen, the topic of sustainability plays an important role also in the Earth orbit. "The most difficult? Learning Russian!" DLR scientists have discovered a planetary system that is astoundingly similar to ours. Could one of the planets be a second Earth?